We’ve all read the quote “Behind every strong man is a strong woman” as well as all of the related quotes that mock the whole idea. While I understand the criticism of this quote, I strongly believe that having a strong support network, whether it’s a spouse or extended family or friends, it’s a critical part of being a successful working parent. At work, when I see someone that I view as very successful, when I am able to get more “behind the scenes” information, I often learn that they have a spouse at home who doesn’t work. Their spouse is doing all of the heavy lifting related to keeping a household running, raising the children, volunteering with the PTA, very important and critical work. Tip #1 Create a Family Calendar and share it with the right people. In my case, I created a calendar on Outlook.com. From any calendar, Outlook.com, Google, Yahoo, whatever, you can “Share” the calendar by clicking the “Share” button and then providing the email addresses of the people you want to share it with. My babysitter and my husband have the calendar. I helped my sitter set up her iPhone so that she sees this calendar. I only add items that show up in the weekday afternoons so that she only sees stuff related to our family when she’s working. She literally uses this calendar on her iPhone as a checklist for what needs to be done today and where the kids need to go. My husband usually has this calendar turned “off” but it shows up in his list of calendar so that he can easily see what’s going on at any time. By creating a Family Calendar, you’re creating a “Communication Center”. All appointments go here. Everyone knows where to look for information. How does this help you at work? You cut down on how many times the babysitter is texting you with random questions during the day about the schedule. In fact, when she DOES send you a text, you know it’s important and related to something that you really need to respond to in the moment. You no longer have your spouse IM-ing you with questions about whether or not you’re free next Thursday after work so you can get together with his co-worker and their spouse. You organize your schedule so you can FOCUS. This is a critical element to being successful at work. if you’re constantly being distracted by things from home, your efficiency at work drops more than you realize. Many working families share the responsibility of dropping off and picking up the kids to/from school and childcare. But work responsibilities often mess up that routine. When an important meeting is scheduled first thing in the morning on a day when I’m usually taking the kids to school, I create a calendar appointment that covers the school drop off time and send it to my husband. If he has a conflict that he can’t move, he just “Declines” and I know I need to figure something else out. The same goes for me. If he can cover it, he “Accepts” and I know I’m covered. Outlook calendar shows family coordination to determine who is taking the kids to school today. By doing this, you’re setting things up in the moment. No need to remember to talk about this when you get home from work (and risk forgetting). No risk of your spouse forgetting to put this in their calendar, not to mention getting on the right day. It’s fast, simple, clear. This same approach can be used for meetings at the end of the day. Have you ever had one of those “Executive Reviews” scheduled from 3 to 5pm? They never end on time. You spend the last half hour of the meeting watching the time. You’re stressed. You’re distracted. You’re not focused on the actual meeting because you’re worried about picking up the kids on time. Don’t put yourself in this situation. When that Executive Review is scheduled for the end of the day, send your spouse a calendar invitation for them to pick up the kids or meet the babysitter. You’re now free to focus on the meeting. Beyond that, often, the most important conversations happen in the hallway after the meeting. Put yourself in a position to be there for that conversation. By taking this simple additional step, you’re lowering your stress, covering the responsibilities at home and creating an environment where you can focus, do your best work and be there for critical conversations. Even with all the right appointments in the calendar, sometimes the family may not be actively looking at their calendars. Family life is all about routine. Routines are what help us manage the chaos and the volume of activities going on. We can keep a lot of that routine in our heads and not rely on a calendar. But the exceptions are the things that mess us up. And the exceptions are the most important things to capture in the calendar because they are hard to remember. On Sunday evening or first thing on Monday morning, email the calendar out to the people who need it. In my case, this is obviously my husband and babysitter. But I also include my ex-husband and the behavioral therapist who works with my son who has Autism. 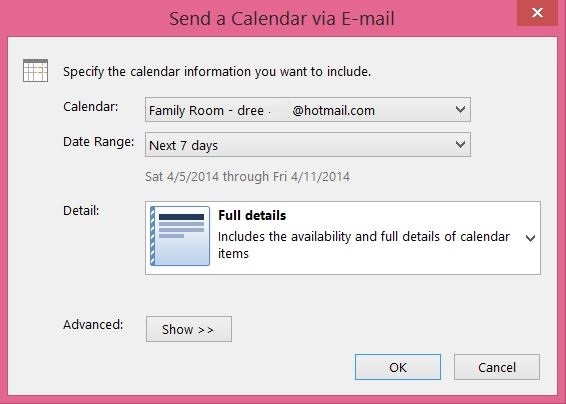 To email the calendar from Outlook, go to the Home tab and select “E-mail Calendar”. From there, you’ll get options to send the “next 7 days” and an email will be created with the calendar info. I highlight the exceptions to the routine so my family can scan the email and get those exceptions for the week in their head. If you use a calendar like Cozi, they have a wonderful feature that automatically sends a weekly calendar to a preset list of people every Sunday evening. By incorporating these 3 tips into your day to day management of your schedule, you’ll be amazed at how it will smooth out the bumps in the week. It should also help you go from “surviving the week” to really excelling at work. Posted in Working Parents.Tagged Calendar, Outlook, time management, working mom, working parents, workingparents.